A chance for you to share your blog posts with other awesome travel bloggers​. ​What is the Feet Do Travel Blog Linkup and how does it work? The Feet Do Travel link up is a chance for bloggers to share their travel posts. Every Friday, a bunch of awesome bloggers add their newest post, or an old one that needs some love. Stories can be anything travel related but it’s a wide subject! Tell us about your wine tours, favourite foods, share travel advice, your story about discovering a new destination, or visiting a popular place with a difference, educate us on being a more responsible/sustainable traveller …. You get the picture. The aim is to grow an established, loyal community, gaining more exposure and traffic for your website via comments and Social Media shares. ​I have a blog! How will I benefit by joining? Be part of a growing network of excellent bloggers – a chance to learn from the best! Your blog will have increased credibility and authenticity, by being part of an established and respectable travel blogger community. ​I'm convinced! How do I participate? Start by joining our Facebook Group. Add our “badge” to your blog and link back to this page. Either grab the badge yourself by right click on the photo, and "save as", or we can send it to you – feel free to ask. This tells others that you are part of a team, and the credibility that comes from that. Adding the badge is also a nice way of thanking your host. When the link up opens, add a link to your travel blog post, it can either be a new post, or one that needs reviving. When does the Linkup open? The Linkup opens midnight (UK time) Friday morning, and closes midnight (UK Time) Sunday evening​. ​Are there any rules or guidelines? Display our badge and link it to this page. 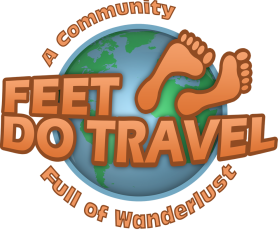 To help spread the word about this awesome community, use the hashtag #FeetDoTravel. We will like and re-tweet. If you add a link, other people will comment/share so be nice and do the same in return. Let people know you have supported them by telling them what you have done! If you want to show extra support for the community, if this is your first interaction with someone, follow them on their social media channels … and tell them! How many other blogs do I need to comment/share? You can interact with as many or few as you like. You don't have to comment/share all posts within the link-up. It's a loyal team so you may be surprised at how much interaction you receive. The comments/shares need to be finished before the next link up is open, and most people prefer to do it over the weekend. You will have plenty of time to do what you can. We all appreciate people are busy and have lives, so if you are unable to finish, just tell people what you are doing – it’s all about being social. This is a great idea! How can I help spread the word about the Feet Do Travel Blog Linkup? Use the #FeetDoTravel hashtag at the end of any comment you leave on blogger’s posts. When tweeting any post from the linkup, add the hashtag #FeetDoTravel. This hashtag is monitored, liked and retweeted. ​Now you are ready … get linking! ​We really appreciate your involvement in the Feet Do Travel blog link up, and supporting our loyal community. We look forward to reading your blog post in the next linkup! If you have any questions, feel free to contact us.